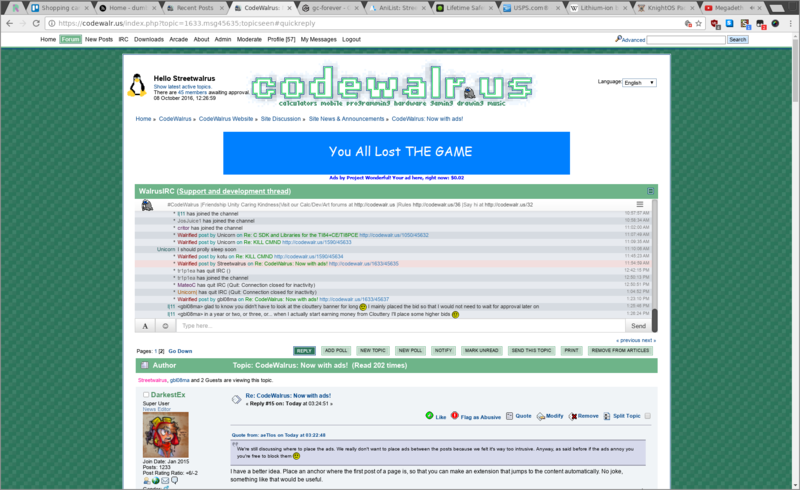 ► CodeWalrus: Now with ads! Re: CodeWalrus: Now with ads! I have a better idea. Place an anchor where the first post of a page is, so that you can make an extension that jumps to the content automatically. No joke, something like that would be useful. Also Darkest while your site content is easy to reach and looks nice, it's 100% text and monochrome with no image. We wanted CW to have a minimum of fanciness so it doesn't look too similar to most Wordpress blogs (not to mention we're a forum, not a blog). That said, for the ads, sidebars would not work on mobile and hiding ads on mobile would defeat the point of using ads in the first place. They just need to be tweaked to not be as intrusive (and I think Juju setup the wrong banner size because I recall Google ads being way smaller than that). Anyway for those who wants the ads gone absolutely, we can always give you the hosting/domain name bill in exchange. $309.80 since October 24th 2014 and it's $13.43 a month in average including the domain name. Eh, Google uses a variety of sizes, as well as Project Wonderful. The leaderboard ad seems indicated for our site in desktop mode, we could always create another ad box for mobile, but I'm afraid it would mess up with the system and incorrectly tag it as not showing up. At least there's scrollbars only on the ad in desktop mode. I do agree with DarkestEx's concerns it would make the header bigger, but yeah we have yet to figure out the optimal placement. Still, I think it's an issue that needs addressing. Otherwise I'll probably just remove the ads outright and create my own Project Wonderful account with them fixed. Or I could check if Project Wonderful TOS allows using CSS to set max width to 100%. Or I could check if Project Wonderful TOS allows using CSS to set max width to 100%. That is probably something you can try. EDIT: I'll look at this soon, tired for now. Would it be possible to hide the ads for the donation group? Sure, but as we already said, the ads are mainly space for members. It's also a way to donate and get more back than just thanks, but I don't expect much. Also the ad should be easy to scale on mobile. Edit: done. That's not much to scroll through imo. As you can see, it's not even possible to see the first line of the first post on the page, and my screen is not exactly small - it actually has an aspect ratio with more height than the typical 1366x768 laptop screen or 1080p. 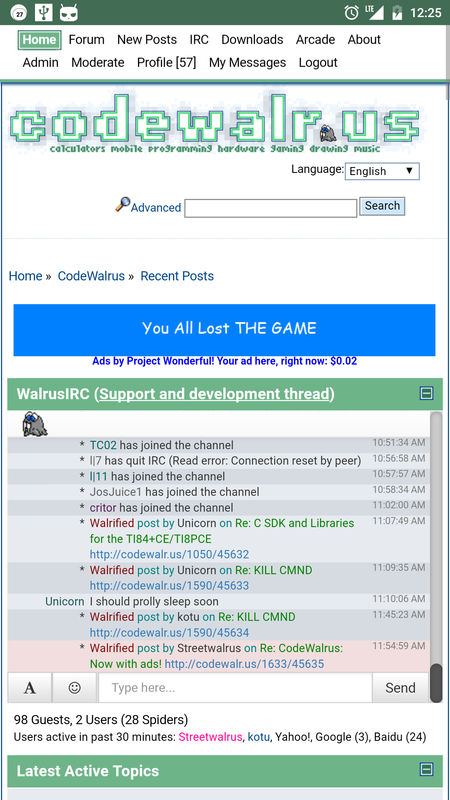 Sure, I can collapse WalrusIRC, but it's nice to see the discussions going on in there. And if one can collapse WalrusIRC, then why not the ads too? I agree that a new theme may help fixing this, as for example there appears to be a lot of whitespace between the codewalr.us logo and the navigation "path". However, white space is also important to make the page not feel too crowded, and so I'm not sure reducing it to make way for ads would be a good idea. Or perhaps there could be an option to make the logo smaller, after all the usual lurkers could probably tell what site they're on even if the logo was removed. Since this ad slot appears to be mainly targeted as a way for members to make "donations with benefits", I think it would be easy for members to adjust to less common banner sizes. I don't know off the top of my head what banner sizes Project Wonderful supports, but perhaps it would be interesting to try a smaller or thinner banner, where the current one is or anywhere else. If the banner is thin enough (say, 32 px height) I think it can even fit between posts without too much disruption. Another idea is to make the banner appear in different places depending on the page. I guess this is not very easy to do with SMF, but here goes anyway. For example, on the topic reply page and maybe on the homepage it could appear where it is now, but on thread reading pages it could appear below all posts - so people wouldn't need to scroll as much to get to the main thread content. I've actually tightened it just now, it looks fine imo. While we're at it, notice my userstyle which limits the width of the page. I've done this long ago because I find it more comfortable to read this way. An idea would be to make this the default and move the ad(s) to the sides. It doesn't solve the problem for mobile, but it would improve the situation on a desktop. For what it's worth, swiping it away on a phone is easier than scrolling down with a mouse. Well, this is much better, I can now see the beginning of the first post and the layout, near the top, doesn't look as "spread around" as before. It's not directly related to the ads, but I have one more layout improvement suggestion: since the "Home »CodeWalrus » CodeWalrus Website » (...)" navigation bar is always relative to what comes after WalrusIRC (i.e. the banner and WalrusIRC are a "constant" just like the logo), would it be possible and/or a good idea to move it below WalrusIRC? this is in firefox, and, yes i have refreshed the cache then reloaded. Alright I've done some changes, tell me what you think about it. Mostly moving the navbar below wirc and optimizing some blank areas.